If the growing cost of healthcare is a concern for your organization (isn't it for all? ), one place we recommend employers look to for cost-cutting is through the Dependent Eligibility Audit - a formal process to verify dependents' eligibility. An audit of a company with 10,000 employees can help uncover as many as 500 ineligible dependents according to an article in New York Times. 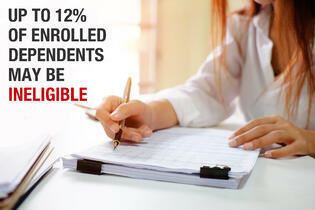 According to experts, as many as 12% of enrolled dependents may not be eligible to receive benefits. Without a formal audit process, this can amount to a sizable and unnecessary expense for any organization. How does that happen? Some employees may not understand enrollment rules or choose to ignore them, and hence may enroll their cousins, boyfriends, girlfriends, roommates, grown children (those over 26) or not report a spousal divorce. Paying for ineligible dependents can amount to huge losses for companies, and with healthcare costs continuously on the rise, the dependent eligibility audit has become more than just a nice to have process. Whether you're new to the topic or need a refresher, below is a look at 3 things Employers should know about Dependent Eligibility Audits. Saving money is the top reason employers pursue dependent eligibility audit. For annual family premiums, employers pay just over $14,000 per employee per year, according to a Health Benefits Survey from Kaiser. By that same estimate, if the dependent premium is $3,500 per year, the savings of finding 250 ineligible dependents would total over $875,000. The math is pretty clear that there's a significant cost of insuring ineligible dependents. Below is cost-projection based on 1,000 employees and their 2,000 dependents. Plug in your own company numbers for a better look at potential cost of insuring ineligible dependents. To demonstrate fiduciary responsibility, it's essential that your healthcare plan only covers those that it should and a dependent eligibility audit helps an organization demonstrate their due diligence should questions arise. Can the plan terminate the dependents coverage retroactively? Should/can the employer recover the payments and refund premiums? Can the employer terminate the employee who failed to remove ineligible dependents? How do COBRA benefits get addressed for those whose ineligibility was not reported timely? It's best to have these terms in place from the start and have consistent follow-through in all cases to help avoid lawsuits and reduce liability exposure.